Nothing can replace the sense of professional fulfillment and personal reward that comes from successfully restoring a patient's smile. This book, which serves as a complete primer on esthetic dentistry, is aimed at that precise reward. Informed by the latest scientific research and clinical evidence, the authors provide readers with keen insight into the artistic aspects essential to achieving a truly esthetic outcome. Preliminary chapters cover esthetic analysis, effective treatment planning, use of digital dental photography, and the importance of interdisciplinary collaboration. 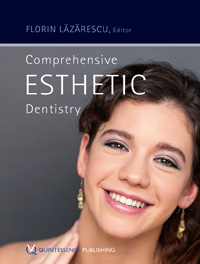 Further chapters outline effective treatment protocols, including the principles of ultraconservative restoration, tooth whitening, anterior and posterior all-ceramic restorations, in-office CAD/CAM technology, implant placement and soft tissue management in the esthetic zone, and the usage of minimally invasive procedures. This book, in its extensive knowledge and passionate voice, represents the union of function and beauty in dentistry, and in doing so, establishes itself as a comprehensive resource in the field of dental esthetics. The primary goal of this atlas was to provide support for dentists, who are interested in composite applications in esthetic dentistry and to provide them with a visual tool in order to better explain treatment details to their patients, as well as reminding them of the fact that it is possible to make alternative restorations by using composites without removing too much tooth structure from healthy tooth tissues for treatment purposes.